The Molten Midas Mouse can be found in Zokor. It is known to drop Unstable Crystals and Labyrinth Theme Scrap IV as loot. Required Power Types: Forgotten Other Requirements: ?? 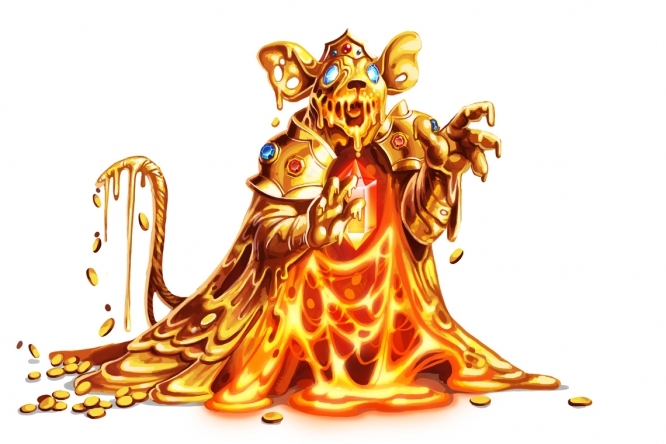 Living within the lavish luxuries of the treasure-filled areas of Zokor lies this viscous liquid-like mouse. He can heat his body to such an extreme temperature that he can melt and then absorb nearby molten gold to increase his body mass. He has grown quite literally attached to the gold and jewels that surround him. The Molten Midas Mouse prefers Glowing Gruyere, but can be attracted with Standard Cheeses. Forgotten weapons are very effective against the Molten Midas Mouse. Arcane weapons are of normal effectiveness. The Molten Midas Mouse can be found in the Treasure Vault. The Molten Midas Mouse drops the Unstable Crystal Egg and the Zokor Treasury Egg during the annual Spring Egg Hunt. 9 September 2015: The Molten Midas Mouse was introduced as part of the Hollow Heights release. This page was last edited on 27 May 2017, at 01:20.